The Emirates Towers is one of the most iconic symbols of Dubai and comprises two skyscrapers, both with a triangular footprint. The taller tower stands 355 metres high and houses offices, including those of ruler Sheikh Mohammed. The smaller tower is 309 metres high and is occupied by the 5-star Jumeirah Emirates Towers hotel. The towers are connected at ground level by The Boulevard, a shopping mall housing around 30 shops and a good selection of restaurants and bars. The mall is one of the most exclusive in Dubai and caters to the rich businessmen and women that work in the area. Shops and restaurants at Emirates Towers Boulevard are listed below. 1847 – Male grooming lounge. Al Nafoorah – Lebanese restaurant. Casabella – Real estate agents. Circle K – Convenience store. Dunhill – Men’s luxury brand offering menswear, leather goods, and accessories. DXD Dental Clinic – Clinic offering a wide range of dental services including orthodontics, veneers, teeth whitening, and dental implants. Kiton – Italian menswear store offering made-to-measure suits, dress shirts, and fashion accessories. La Cantine du Faubourg – French restaurant. La Casa del Habano – Cuban cigars. Montblanc – Luxury brand offering pens, leather goods, watches, jewellery, fragrances, and eyewear. Montegrappa – Pens and accessories. More Mischief – Menswear by Indian designer Deepak Shah. Noodle House – Asian restaurant. PRO TECHnology – Apple products. Rodeo Drive – Designer clothes. Talise Fitness – Health and fitness club. Yateem Optician – Designer frames, contact lenses, sunglasses etc. 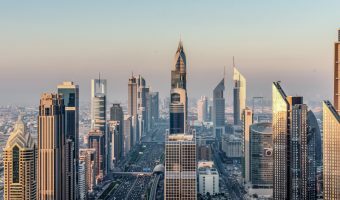 Emirates Towers and The Boulevard are located on Sheikh Zayed Road, between the Dubai World Trade Centre and Dubai International Financial Centre (DIFC). 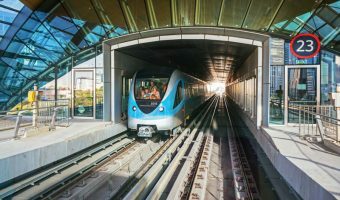 The nearest Metro station is Emirates Towers Metro Station. It’s situated on the Red Line and within easy walking distance of the mall and towers. Map showing location of Emirates Towers Boulevard.